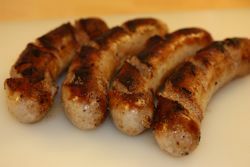 Jason Drage made up some brats for an "Octoberfest" event at a local pub recently and we managed to bag a few so the troops here could try them! The Churchgate Bratwurst ate very well I hasten to add, even if they are "foreign sausages"! 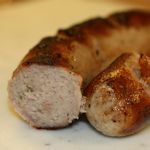 We tried them with mash and onions, although the purists would say that they would have tasted better in a bread roll with a dollop of German mustard! They're very "porky" with a smooth texture and have a firm bite and good chew. 150x34mm before cooking, 140x30mm after. 98g before cooking, 88g after. That's a shrinkage of 10% & weight loss of approx 17%.